They're back and ready to set your bodies into motion and make it go ' 'bump, bump, bump'! The reunion that fans never expected would happen in this lifetime is finally happening…The sensational boys of B2K are all geared-up to come together onstage for the very first time once again in The Millennium Tour, also featuring Mario & Pretty Ricky. On Sunday 14th April 2019, the stage at The Forum will transform into one big reunion party like no other. With this piece of great news hitting the headlines and becoming the trending hashtag on social media, fans were on their feet and stormed online portals for tickets. It's just a click away, so get those fingers moving before seats run out. Book your tickets now! "We’re thrilled to announce that the fans relentless petition for a reunion has not gone unheeded…Through collaborative efforts, B2K answered the call. The stage has been set, the journey continues, please get ready for the triumphant return of B2K." Those were the words of Damuer H. Leffridge, managing partner at Blvd. Music, that made it official — B2K is back and raring to go on a Millennium Tour! The stylish and edgy boyband made up of Omarion, Boog, Fizz and Raz B, formed by American record producer Chris Stokes in the early 2000s and collectively called themselves B2K made significant milestones that included hit records, chart-toppers, sold out shows, concert TV specials, and a big-screen movie to boot. And of course, legions of fans who were utterly devoted to the group even past their break-up in 2004. They were responsible for the hits "Bump Bump Bump," "Gots Ta Be." and "Badaboom." Their debut album featuring the single "Uh-Huh", peaked at #2 on the Billboard 200 and #1 on the U.S. Hot R&B/Hip-Hop Songs albums chart. Though the boys have gone their own separate ways, with Omarion leading with his solo efforts that earned him two No. 1 albums on the Billboard 200 and hits like "Ice Box," and 2014 banger, "Post to Be," fans continued to clamour for a reunion. "While admiring their solo successes, the fans have consistently demanded a B2K reunion and, with the determination of an incredibly talented team, that dream is now a reality, " says Michelle Le Fleur, COO at Omarion Worldwide. 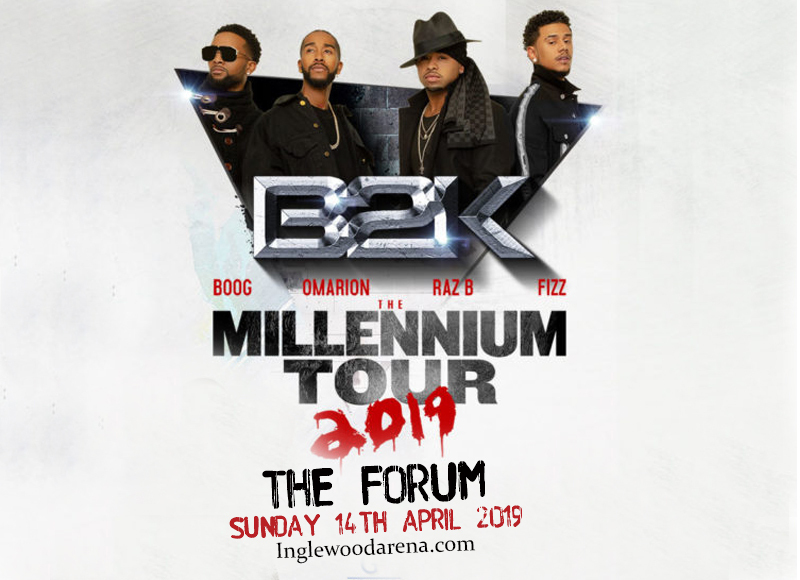 Now wake-up to the moment when B2K hits the stage on Sunday 14th April 2019 at The Forum. You've waited over a decade. Rise and shine, the dream reunion and tour is for real…get your tickets now!